Is It Time for “Jumbo Joe” Thornton to Take a Knee? 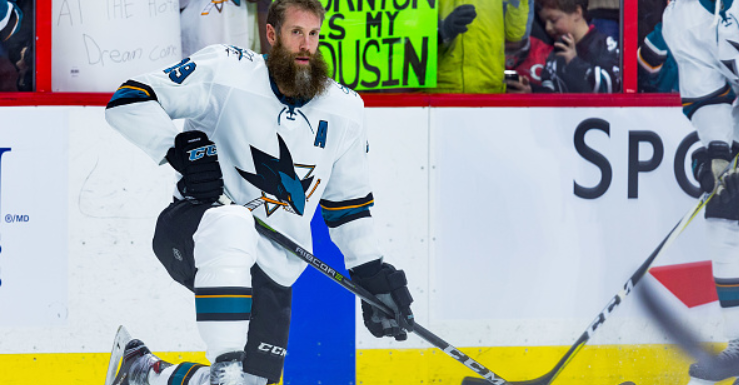 The question isn’t whether or not Joe Thornton can return — he can; the question is, should he? And it’s high time — not only for Sharks and NHL fans who mostly love Jumbo Joe — but for Sharks management and coaching staff to seriously consider it, before he does return. Because he will. Thornton had knee surgery number one in April 2017. What stood out to me during the ensuing games that spring was the contrast between the media narrative and what I saw on the ice. The talk was all about the hope for a returning Jumbo, lamenting the absence of his vision and passing genius, his leadership presence, the skunk beard, and so on. But what I saw was a team that played faster, moved off the puck faster, executed faster, and caught teams off guard with speed rather than eye-of-needle passing. And at the risk of hockey heresy, I liked it. Not just for the enjoyment factor but for this team’s prospect of success. I wondered even then, are the Sharks not better off? Thornton recovered remarkably fast, ready to go a few months later for the new season. Until January. January 2018, the other knee let him down both literally and figuratively: surgery number two. Although he returned to practice with the team in March, once again seeming to defy expectations, he did not crack the playoff lineup before the Sharks were eliminated by the Golden Knights. Perhaps Coach DeBoer wanted to see just what he had without Thornton when the games mattered most. What we saw once again was a more aggressively attacking and skating team, a faster puck-moving team. Yes, Thornton is a genius when holding the puck and allowing the time-space continuum to slow down as he surveys the mere mortals around him. You don’t see him make a pass very often on anyone’s schedule but his own. And when he makes release it, the pass is often Poetry’s and Geometry’s love-child. But is this what wins in today’s NHL? And is this what the Sharks need most now? I would argue, no. Now, to be clear, nobody wants to see Jumbo go out this way — without returning to finish a playoff run, especially given the possibility of going all the way. Nobody — Sharks fans and NHL fans alike — wants to see this guy go out on any terms but his own. Joe Thornton is one of those truly beloved athletes in a time when fans have grown cynical toward player personalities in general. Brad Marchand is surely not beloved. Even Crosby is not beloved. Admired and idolized, yes; but beloved? No. Connor McDavid is worshipped as “McJesus,” but that’s also not beloved; not even Tavares (by any pronunciation), among Torontonians, is the same kind of beloved. But with Thornton out once again — an infection in the recently repaired knee — we see the team shift a little in its style of play. It doesn’t happen right away, apparent from the Islanders’ 4-0 smoking of the Sharks in the first game of Thornton’s absence. But then they went out to absolutely destroy Philly 8-2, and you can guess how they played that game. Next, against the Rangers, the Sharks similarly carried the play for much of the game, but like game one against John Gibson and the Ducks, the Sharks met a Lundqvist so hot they had a tough time keeping ice around him. And they let down at the wrong time, although . . . is there ever a right time? — seemingly a dumb question, but considering Coach DeBoer’s tendencies, it might not be so dumb and may be worth exploring. It seems clear that DeBoer does think there are appropriate times to hold back, to “take the foot off the gas” and play more of a shut-down game. And worse, it seems that time is whenever they have a lead — even a one-goal lead. And it doesn’t usually work; more important, it will not work for this Sharks roster as they are built to press an advantage — not to maintain it. Yes, Erik Karlsson is as brilliant a shut-down defenseman as he is an offensive one; in the short span I’ve seen him in San Jose, that much is already clear. He is maybe bested defensively by Vlasic, and that can be debated. And this all comes back around to Joe Thornton in several ways. First, because DeBoer inclines toward protecting leads, however small, he will incline toward slowing down the play in these situations and maybe all situations. Second, because DeBoer consistently favors veteran presence in the line-up, he is less inclined to ride out the learning curve of players like Rourke Chartier, who might contribute to that fast-pace, attacking style; this tendency makes DeBoer more likely to hanker for Thornton’s return to the ice to “control” the play, thus pushing out young speed and talent once again. So, while people out there are berating Sharks fans for overreacting with angst so early in the season, most don’t understand what’s truly bothering them. It’s not that they don’t think the squad will find its chemistry, it’s not that they don’t think Burns will find some positional play, it’s not that they think some workable defensive pairings will never happen despite the coaching staff, and it’s not even that they are panicked about the lack of center depth — it’s really an underlying lack of confidence in the coaching staff. Nobody is questioning DeBoer’s coaching ability or value: if you’re an NHL coach, you are one of 31 of the very best coaches in the world. That is the definition of elite. If you are an NHL coach, you are also smarter than the rest of us about hockey — no question. Probably smarter than us about tracking caribou, too. But even a genius can have blind spots. The lack of confidence — or doubts even — are that DeBoer will figure it out, that he will learn to overcome his habits or prior instincts, that Steve Spott, power-play coach, and the rest of the coaching staff know what to do with their individual squads and the team as a whole. And in the end, it’s the fear that the greatest defenseman in the world on a team with a world-beating roster might go down as a wasted opportunity — not due to their own effort, skill or will, but due to their leadership.